A 19th-century fantasy portrait, based on the face of Hartman Hartmanzoon (1591–1659) from Rembrandt's The Anatomy Lesson of Dr. Nicolaes Tulp. No genuine portrait of Jan Swammerdam is known. Once he left university, he spent much of his time pursuing his interest in insects. This choice caused a rift between Swammerdam and his father, who thought his son should practice medicine. The relationship between the two deteriorated; Swammerdam's father cut off his financial support for Swammerdam's entomological studies. As a result, Swammerdam was forced, at least occasionally, to practice medicine in order to finance his own research. He obtained leave at Amsterdam to dissect the bodies of those who died in the hospital. From 1667 through 1674, Swammerdam continued his research and published three books. In 1675, he came under the influence of the Flemish mystic, Antoinette Bourignon, renounced his work, and decided to devote the remainder of his life to spiritual matters. Niels Stensen, a gifted anatomist, and once his co-student, invited him to work for the Duke of Tuscany, but Swammerdam refused. The grand duke of Tuscany offered 12,000 florins for Swammerdam's collection, on condition of Swammerdam coming to Florence to continue it. There is evidence, however, that Swammerdam did not completely give up his scientific studies. The papers, which he wished to be published posthumously, appear to have been revised during the last two years of his life. Swammerdam died at age 43 of malaria and was buried in the Église Wallonne. In 1737–1738, a half century after his death, Herman Boerhaave translated Swammerdam's papers into Latin and published them under the title Biblia naturae (Book of Nature). 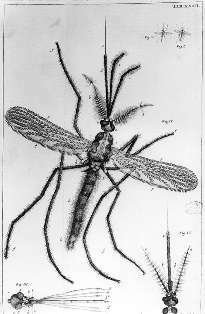 An English translation of his entomological works by T. Floyd was published in 1758. His entomological collection was divided at his death and sold in small portions. As a naturalist of his time, he has been compared with Anton Leeuwenhoek. Knowledge of insects in the 17th century was to a great extent inherited from Aristotle. According to this classical paradigm, insects were so insignificant they weren't worthy of the types of investigations done on fish, reptiles, and mammals. Much of Swammerdam's entomological work was done to show that the difference between insects and the "higher" animals was one of degree, not kind. Swammerdam is credited with the enhancement of the study of biology due to his work dissecting insects and studying them under microscopes. Swammerdam's principal interest in this area was demonstrating that insects develop in the same gradual manner as other animals. He wanted to dispel the seventeenth-century notion of metamorphosis—the idea that different life stages of an insect (e.g. caterpillar and butterfly) represent different individuals or a sudden change from one type of animal to another. He garnered evidence against this claim from his dissections. By examining larvae, he identified underdeveloped adult features in pre-adult animals. For example, he noticed that the wings of dragonflies and mayflies exist prior to their final molt. Swammerdam used these observations to bolster his case for epigenesis in his 1669 publication, Historia Insectorum Generalis (The Natural History of Insects). This work also included many descriptions of insect anatomy. It was here that Swammerdam revealed that the "king" bee has ovaries. Biblia natura published posthumously in 1737, carried the first confirmation that the queen bee is the sole mother of the colony. Despite five intense years of beekeeping, the mode of honey bee reproduction escaped him as he wrote, "I do not believe the male bees actually copulate with the females." In addition to his research on metamorphosis, Swammerdam's entomological work stands out because he was among the first people to study insects in a systematized fashion (i.e., careful dissection, comparison of different species, and use of the microscope). His anatomical and behavioral descriptions of bees, wasps, ants, dragonflies, snails, worms, and butterflies were major contributions to the nascent field of entomology in the late seventeenth century. Besides Historia, he published Miraculum naturae sive uteri muliebris fabrica in 1672 and Ephemeri vita, in 1674. The latter was a study of the mayfly, written at a time when he was becoming increasingly involved in spiritual matters. The work contains long passages on the glory of the creator. His Bybel der Natuure was a collection of his papers and drawings. Swammerdam was not a pioneer in the study of anatomy as he was in study of insects, but he nonetheless made important contributions. His use of, and experiments with, frog muscle preparations played a key role in the development of our current understanding of nerve–muscle function. The experiments introduced a new method of studying nerves, the frog nerve-muscle preparation, which was still used centuries later. In one experiment, Swammerdam removed the heart of a frog and observed that touching certain areas of the brain caused certain muscles to contract. For Swammerdam, this was evidence that the brain, not the circulatory system, was responsible for muscle contraction. Swammerdam played a key role in the debunking of the balloonist theory, the idea that 'moving spirits' are responsible for muscle contractions. The idea, supported by the Greek physician Galen, held that nerves were hollow and the movement of spirits through them propelled muscle motion. René Descartes furthered the idea by basing it on a model of hydraulics, suggesting that the spirits were analogous to fluids or gasses and calling them 'animal spirits'. In the model, which Descartes used to explain reflexes, the spirits would flow from the ventricles of the brain, through the nerves, and to the muscles to animate the latter. According to this hypothesis, muscles would grow larger when they contract because of the animal spirits flowing into them. To test this idea, Swammerdam placed severed frog thigh muscle in an airtight syringe with a small amount of water in the tip. He could thus determine whether there was a change in the volume of the muscle when it contracted by observing a change in the level of the water (image at right). When Swammerdam caused the muscle to contract by irritating the nerve, the water level did not rise but rather was lowered by a minute amount; this showed that no air or fluid could be flowing into the muscle. Swammerdam did not believe the results of his own experiment, suggesting that they were the result of artifact. However, he concluded in his book The Book of Nature II that "motion or irritation of the nerve alone is necessary to produce muscular motion". This idea that nerve stimulation led to movement had important implications for neuroscience by putting forward the idea that behavior is based on stimuli. Swammerdam also discovered valves in the lymphatic system, which were later dubbed Swammerdam valves. Jan Swammerdam was among the first to experimentally study muscle contraction. He used frog leg muscle along with its adherent nerve as a model for his experiments and observed muscle thickening (contraction) on nerve irritation (stimulation). He later on improved upon his technique by putting two needles at the muscle ends which showed movement on nerve stimulation. He even put the muscle into a glass pipe to avoid direct touching of its belly and used brass wire to fix the nerve and silver wire to stimulate it. Though he was very close in understanding the true nature of bioelectricity in neurophysiology; his experiments have greatly inspired many budding neurophysiologists. Though Swammerdam's work on insects and anatomy was significant, many current histories remember him as much for his methods and skill with microscopes as for his discoveries. He developed new techniques for examining, preserving, and dissecting specimens, including wax injection to make viewing blood vessels easier. A method he invented for the preparation of hollow human organs was later much employed in anatomy. Swammerdam's scientific work was deeply influenced by his religious views. For him, studying the Earth's creatures revealed the greatness of God; scientific pursuits were pious activities. His spiritual views not only motivated his work, but also affected his ideas about the natural world. For example, he rejected metamorphosis and spontaneous generation because they represented randomness and haphazardness that was not possible in a world regulated by God. His ultimate departure from the scientific scene in 1675 can also be attributed to his religiosity. 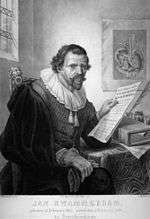 Perhaps due to the influence of Antoinette Bourignon, Swammerdam came to believe that his scientific work was no longer in the service of God. He thought he was conducting investigations into the natural world merely to satisfy his own curiosity. As a result, he subjected himself to the tutelage of Bourignon and, for the most part, renounced scientific study. 1 2 3 Ripley, George; Dana, Charles A., eds. (1879). "Swammerdam, Johannes". The American Cyclopædia. 1 2 Baynes, T.S. ; Smith, W.R., eds. (1887). "Swammerdam, John". Encyclopædia Britannica. 22 (9th ed.). ↑ "Jan Swammerdam's "portrait"". Retrieved 22 January 2013. 1 2 3 4 5 6 7 8 9 10 11 Cobb M (2002). "Timeline: Exorcizing the animal spirits: Jan Swammerdam on nerve function" (pdf). Nature Reviews Neuroscience. 3 (5): 395–400. doi:10.1038/nrn806. PMID 11988778. This article incorporates text from a publication now in the public domain: Chisholm, Hugh, ed. (1911). "Swammerdam, Jan". Encyclopædia Britannica (11th ed.). Cambridge University Press.